The findings include two different hominid species: Australopithecus africanus and Australopithecus robustus. The first was a predecessor of the homo sapiens, the second shared its time on earth with early humans. 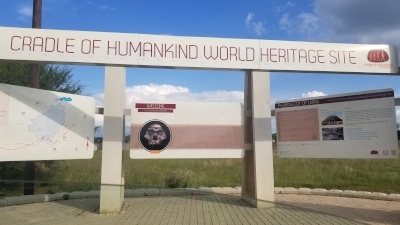 Among the inscribed locations is the Taung Skull site, where in 1924 the first example of the Australopithecus africanus was discovered. The oldest fossils date to 3.5 million years ago. The oldest stone tools have been discovered here too, and the oldest evidence of controlled use of fire. Hundreds of specimens of hominids and early humans have been found, these high numbers contribute to the value of these sites. My two-week journey around eastern South Africa is going to be one of obscure sites. This is partly inevitable, due to remoteness or lack of tourism features of WHS like Mapungubwe and Vredefort Dome. But my first site of this trip is an obscure one by choice: for ticking off the Fossil Hominid Sites of South Africa, there is the easy option of the Sterkfontein Caves (close to Johannesburg). From what I gathered it’s a bit of a zoo, so I opted for one of the other inscribed sets of fossil hominid caves. Fortunately there’s one about half way on the road north between Johannesburg and Mapungubwe: the Makapan Valley. The Makapan Valley was added as an extension to the Sterkfontein area in 2005. It is said to enrich the original nomination, with its long unbroken record of occupation (spanning almost the entire 3.5 million years) and the recovery of fossil fauna alongside. The location (notably the Cave of Hearths) was deemed “as good” in its own right as the Ethiopian Valleys of the Omo and the Awash. The hominid fossils found here are of the Australopithecus africanus and Homo heidelbergensis species. Gaining entrance to the site proved not to be easy, especially while organizing it from abroad. I learned that the area can currently only be visited on appointment. The e-mail adresses that I found online turned out to be invalid however. So I decided to just show up at the associated Arend Dieperink Museum in nearby Mokopane. The museum is a charming ramshackle private collection with bits and pieces of local history. There’s one exhibition room devoted to findings from the Makapan Valley. It may not look much from the outside, but I was delighted to come eye-to-eye with several skull fragments of specimens of the Australopithecus africanus. They really had much smaller heads than modern humans. Upon leaving the museum, I asked the lady in charge how to go about a visit to the Makapan’s Caves. “You can go there now – it’s always open”, she replied. So no appointment then? I was a bit sceptical, but decided to drive there anyway. The caves lie north of Mokopane, at a signposted turnoff from the ‘old’ road to Polokwane. The last couple of kilometers to the site itself are on an unpaved road. It was just doable with my standard rental car. I had no idea where I would end up, but after passing a hamlet called Makapan Valley I found myself right in front of a gate of National Park proportions. A female guardian came up and after telling that I’d like to see the caves, she directed me inside and said that a guide would be available for me there. I arrived at what is now ‘the office’ of Makapan Valley World Heritage Site. The guide on duty asked “Have you paid for the tour already?”. Apparently one has to pay at an office on the outskirts of Mokopane (at the Mokopane Center across the street from the Park Hotel?) – which of course I didn’t know about. But he took pity on me, and got into the car with me to the caves that lie still much further into the countryside. Three caves are open to visitors. The first one has limestone deposits, that’s where the hominid fossils were found. When we arrived at its gate though, it turned out that my guide had forgotten to bring the right keys. Not wanting to drive all the way back on the bad road, we just went on to the other two caves which lie next to each other. These particular caves were used for mining, and railway tracks are still visible. First we saw the Cave of Hearths, renowned for the first hominid-controlled fire and many stone age findings. The top layer of the cave has almost collapsed. 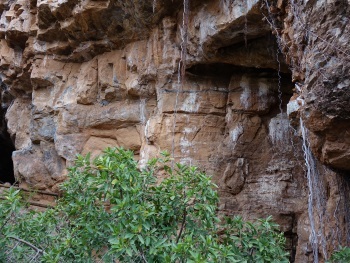 And along the same trail lies the ‘Historic’ Cave – the site of a siege between the local Kekana Chief Makapan, who with his clan members sought refuge in these caves, and the advancing Voortrekkers in 1854. A “world-class” Visitor Centre with auditorium was planned for Makapansgat in 2005, paid for by lottery money. It never materialized. Of course the stories and findings are much more exciting than the actual caves. A remarkable object found here is the Makapansgat Pebble: a 3 million years old pebble shaped like a human face. It’s a ‘manuport’, probably the oldest ever found: a natural object removed from its original setting by humans (or hominids), who did not alter it but took it back to the cave because they may have recognized its symbolic or aesthetic value. “Great, ANOTHER fossil site” I thought, as I planned my trip through ZA and mapped the WHS on my itinerary. This is one is so easy to access just at the outskirts of Joburg, within an hour from the airport (traffic sucked a little on that day, or any day?). There are tours every half an hour and I recommend arriving 20min before to use the toilet and go through the exhibition area before descending into the Sterkfontein cave. I hate to say this but the exhibition room is the best thing to see on this site. Fossils of early man found in the cave below and explanations of how homo sapien has evolved. A rather simple science lesson and nothing I hadn't been explained at all the other early man sites. Once you are in the cave, after a brief explanation of a sun dial outside, the tour has really little to do with that anymore. A group of science students does come here once in a month to dig for more fossils but nothing has been found in years. Instead, you get more explanation about limestone and stalactites and mining operations. Interesting is that the remains of Mrs Little actually later were found to be of a young boy and the early sexist scientists just assumed that a small brain must belong to a woman! Another interesting fact is that the rest of the site is on private land. When I asked if there are attempts to gain the land for science purposes the rest of the group turned the conversation into a rant about how the land is probably owned by Whites and bla bla bla, suddenly the tour went on another half an hour. Once this is finally done you can go outside and take a look at top of the cave where they excavated more fossils. Nothing to see bur rocks overgrown with grass. I have been there, I don't live too far, and I must say, even though they show you fakes, in this country you cannot afford to let the real ones just be there.... but i must say it is as close as you can get to the real thing and all the extra first hand information about history that you can experience in a very futuristic way definitely makes it worth your while.. It is possible to visit the Sterkfontein caves but you have to find your own way to get there. They do tours of the caves for a nominal fee (tips are optional) but don't expect to see many fossils. The archeolocial digs were all closed off. The caves are impressive and it is a good day out, considering the many unique private restaurants in the area. That way you could drive around the Highveld countryside enjoying some time away from the city bustle of Johannesburg. From "The Fossil Hominid Sites of Sterkfontein, Swartkrans, Kromdraai and Environs" - to "Fossil Hominid Sites of South Africa"
"Cave Man" sites: "comprises a number of fossil-bearing cave deposits which are considered to be of outstanding universal value, because they encapsulate a superbly preserved record of the fauna, including an invaluable record of the stages in the emergence and evolution of humanity, over the past 3.5 million years."